Fresh pears dehydrated into delicious pear chips! We have two pear trees and we get enough pears to eat from them. My neighbor has two pear trees as well. Her trees are beautiful mature trees that produce more pears than she knows what to do with. We have been invited to pick as many pears as we want. You wouldn’t believe how many pears I have sitting in my kitchen right now! 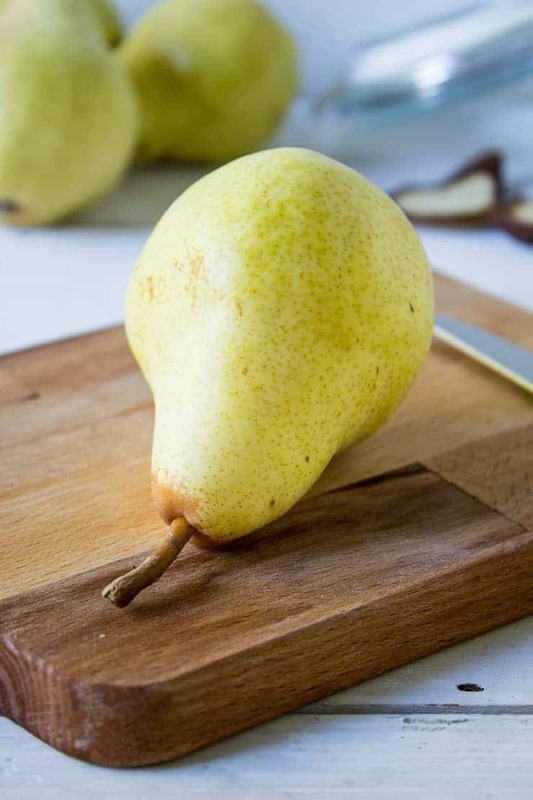 When you pick pears, you don’t wait until they are at the peak of ripeness….unless you are just wanting to pick one to eat right at the moment. Usually you pick pears while they are still slightly green. You don’t want to pick them too early, but if you wait too long, the pears bruise with every touch and they also start to fall from the trees with any movement. To test for the perfect pear picking time, you gently grab a pear in your hand and bend it up. If the stem snaps, they are ready to pick. 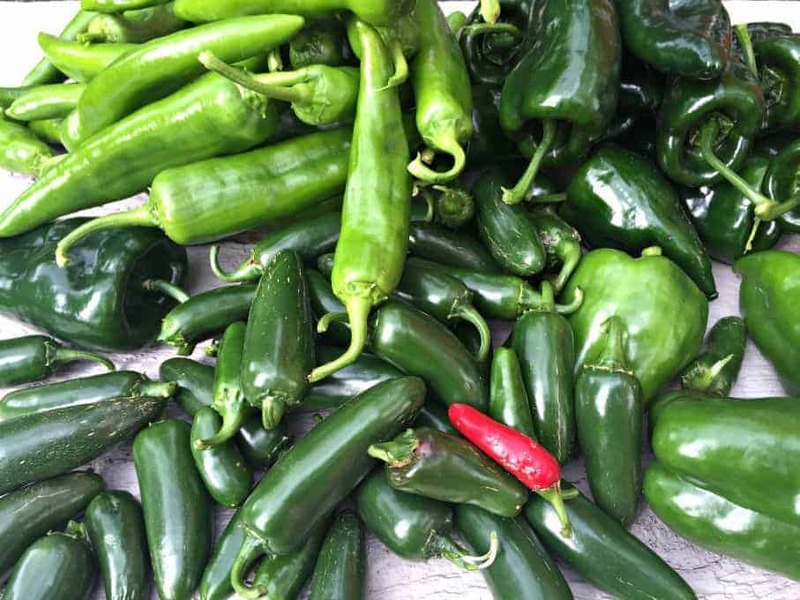 They aren’t ready to eat yet, but they are ready to be picked. I picked 5 huge laundry baskets full of pears. I know what you’re thinking! Laundry Baskets???? Really???? Yep! They are quite handy for picking, carrying and storing. 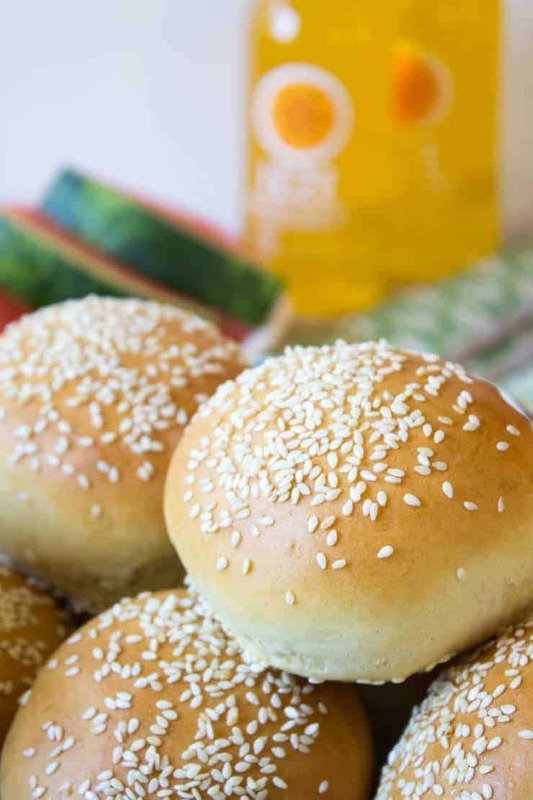 They are sturdy, they have air holes which is great while they are ripening and they usually have great handles which makes it easy for carrying. My kids are complaining because I took all the laundry baskets, but hey, they’ll get them back in a week or so! Why so many pears? We eat pears, can pears, and dehydrate pears into pear chips and I just have a hard time not getting as many as possible! Although, I left a lot behind. Even with all that I picked, my neighbors trees are still loaded. I am waiting for the pears to ripen for canning. In the meanwhile, I am using several while they are still green. The green ones are just perfect for turning into Pear Chips! In fact, they are easier to use while slightly green than waiting for them to ripen. They are so easy to cut when they aren’t ripe. I just slice them up with the skins still on and plop them onto the dehydrating trays. Right now my dehydrator is going 24/7. I can hardly keep up with the way the kids eat these things! They love ’em!!! 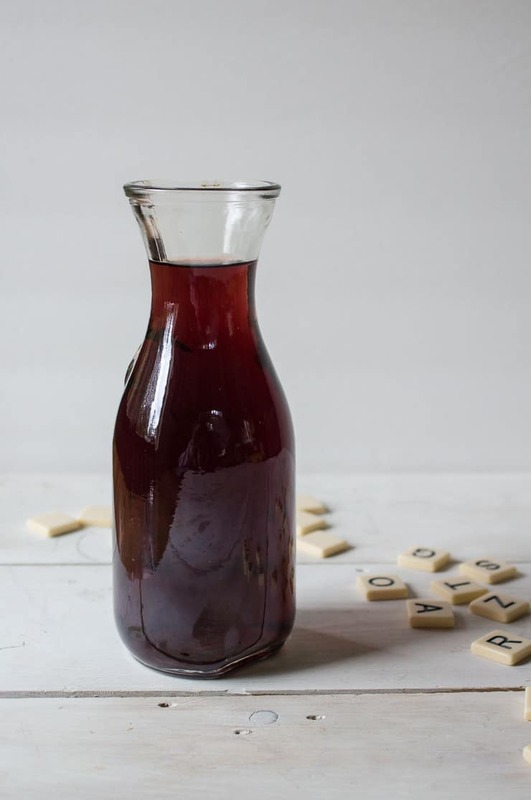 There are a lot of ways to make these dried pears, but I love them best with nothing but pear….no lemon juice, no spices……just plain pear! Of course, you could always add a sprinkling of cinnamon if you really wanted. 10 whole Pears still slightly green. 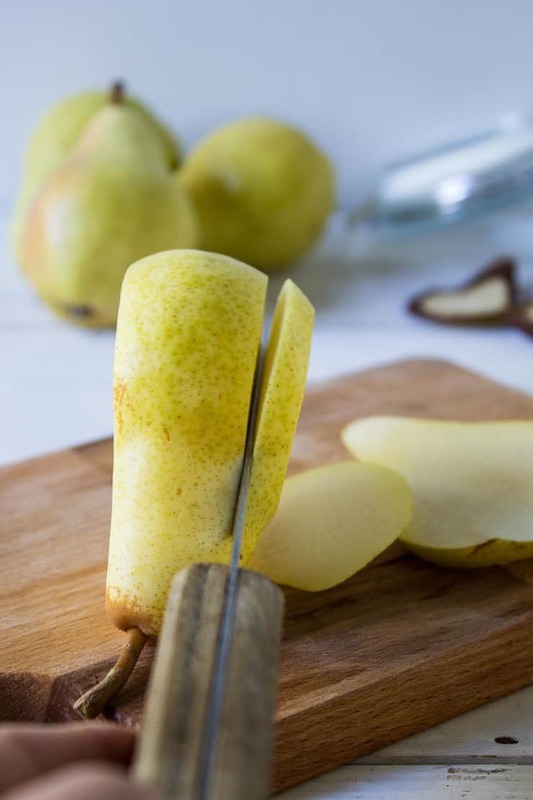 Slice pears with skins still on, discard core. Place on dehydrator trays so the slices are not overlapping. Dry for 8- 12 hours, depending on your dehydrator. Store in a food safe container. Any amount of pears works. 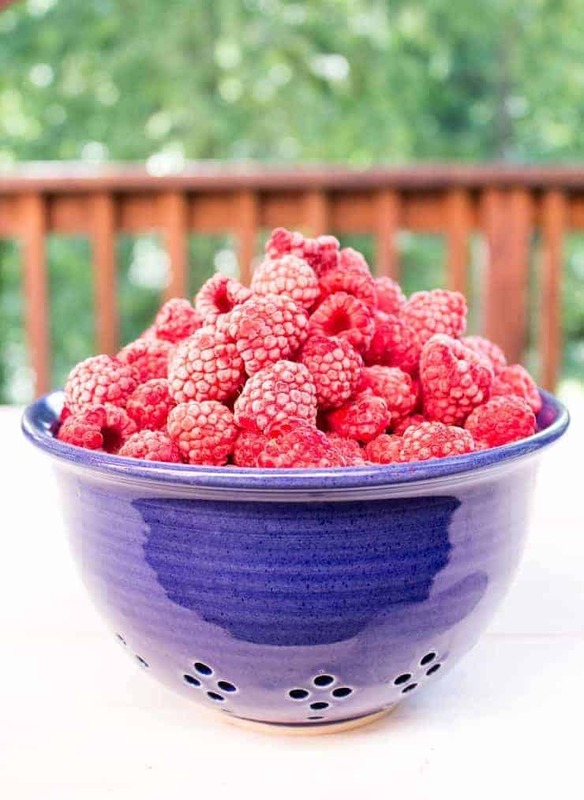 You are only limited to the amount of drying space you have on your dehydrator. It is best to use pears while they are still slightly green. 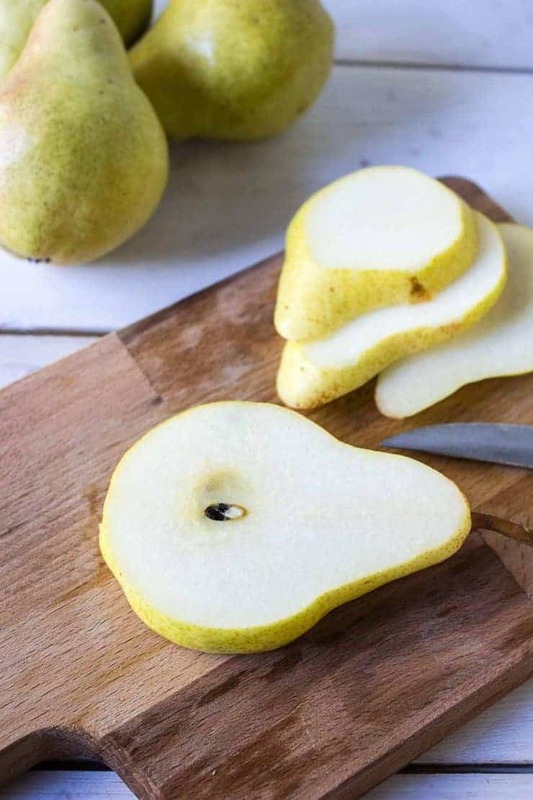 Drying times vary, depending on your dehydrator, amount of pears drying, thickness of slices and ripeness of pears. I enjoy cooking meals and treats for my husband and three teenagers. They are my official taste testers! All our visitors really like pear chips. Do these come out crisp or so bendy? The longer you dry them the crispier they will become. Love these! Need to make them for our camping trip next week! I cant wait to try these! I love pears but have never thought to make chips out of them! Yum! They make a great, healthy snack! Isn’t growing your own fruit wonderful, Kathy – I have a mature lemon tree that gives me lots of lemons. I planted a tiny plum tree last year and it gave me 6 plums this year – hoping for a much bigger harvest in the years to come. This year I planted a gauva pineapple tree and a lime tree – fingers crossed they both do well! Yes! I do love growing our own! I love that you have such a great variety. Good luck on the guava pineapple and lime! Those wouldn’t survive our winters here. Your pears look beautiful! 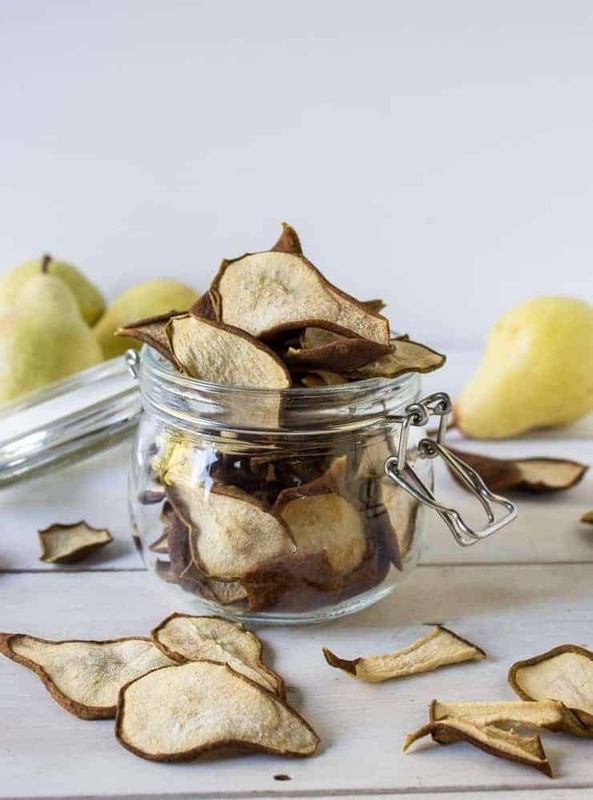 I wish I had a pear tree in my garden – dehydrating and eating them as a healthy snack is such a great idea! Thanks, Miriam! The pears take some time to dry, but otherwise aren’t a lot of work! Definitely worth making. So many pears, I wish I could pick some myself. I actually prefer to eat them slightly green, I don’t like them soft… The chips look amazing, I’ve never had any. There are a lot of pears! Once they turn soft and yellow they don’t last long at all! Such a healthy and delicious snack. These pear chips look fantastic, Kathy. Sadly I don’t have a dehydrator. Can I bake them? I haven’t tried baking them. If you try, bake them on the lowest setting the oven goes. I am always so jealous of all your home grown fresh produce! Chris is always saying we should use our dehydrator more. Maybe if he would plant me a pear tree we could make these beautiful pear chips! I can’t believe you have so many they fill clothes baskets! I just couldn’t stop picking them! I left just as many on the trees too! It’s a great year for pears. I wish I would of seen this before my pears got to ripe course went to the kids and so did 3 boxes LOL But I am going to try your pear chips next year. One ? though when you can your pears do they stay nice and white or do they turn a little tan or sometimes pink like mine do???? Tried everything I can think of to make them stay white sooo maybe you can give me some advice 🙂 Happy canning its work but they sure do taste good in the winter. I don’t do anything to my pears and they do brown a bit. You could try dipping your slices in a lemon bath (equal parts lemon juice and water). I don’t peel mine and the peel always browns. I always peel mine but maybe will try not next year they would be better for you anyway huh. Would really give my grandsons to wonder what g-ma was doing now LOL. Was so nice seeing you too. I love doing these tea’s. 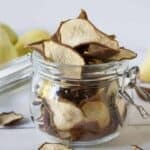 I don’t have a dehydrator Kathy, but these pears are looking so easy and delicious I may have to invest in one! Dehydrators take up a lot of space when not being used, but they sure are handy when we need to dry fruit or make jerky. Five huge laundry baskets filled with pears? I love the visual and your chips!! 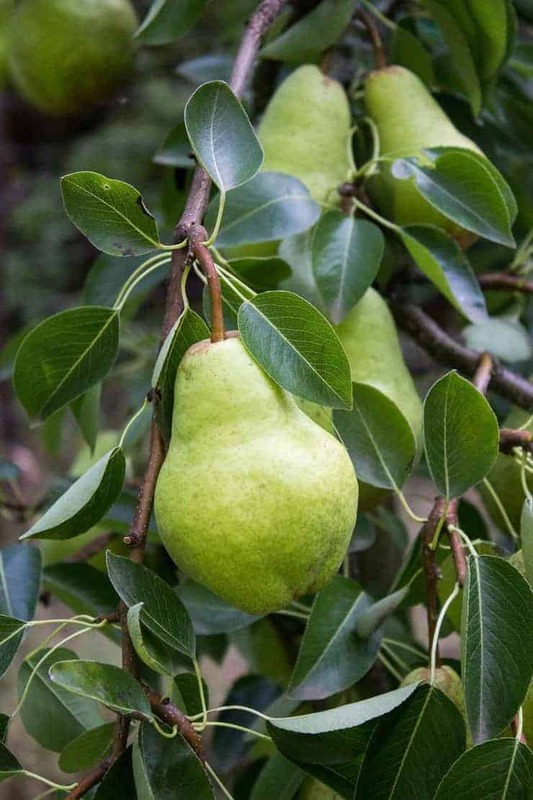 We love pears but don’t have any pear trees, not any neighbour with pear trees. I love your pear chips! 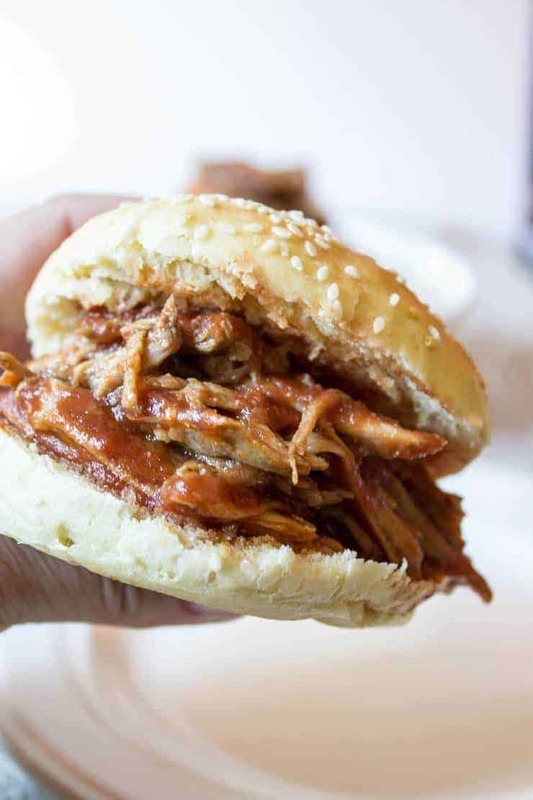 Perfect to snack on! One pear is a start….but not quite enough to do much more than eat! Every year you should get more and more pears! Can I live next door and take part in this pear bounty? My parents tree produced a single lonely pear and thats it. But enough about that – these pear chips sound so healthy and delicious! Come on over! I’ve got plenty of pears to share! Well it’s a good thing I’m not your neighbor because I would be stealing all your pears, Kathy! 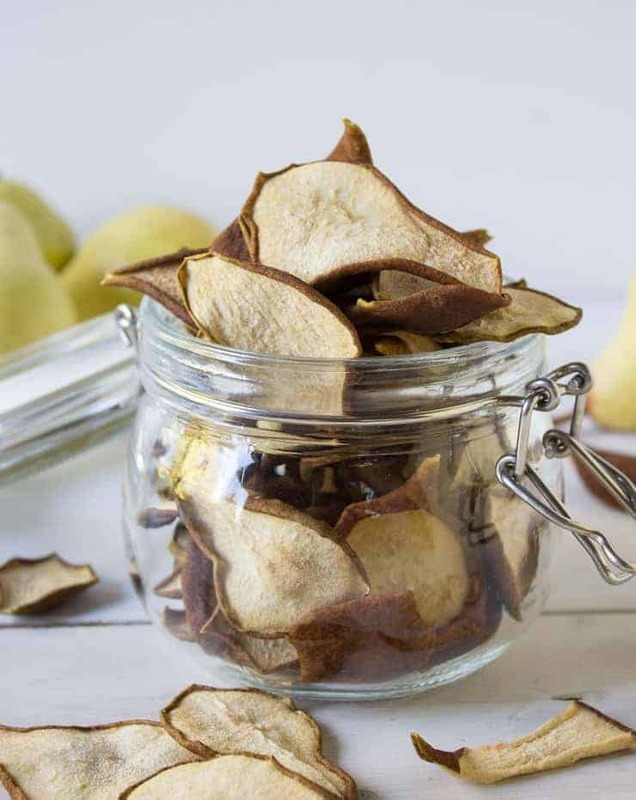 😉 These pear chips are SUCH a great way to use up all your fresh pears! I don’t have a dehydrator or I’d be doing this immediately! This is the perfect snack!! Cheers! I’d be sharing all these pears willingly! Plus there’s still a ton left on the tree! 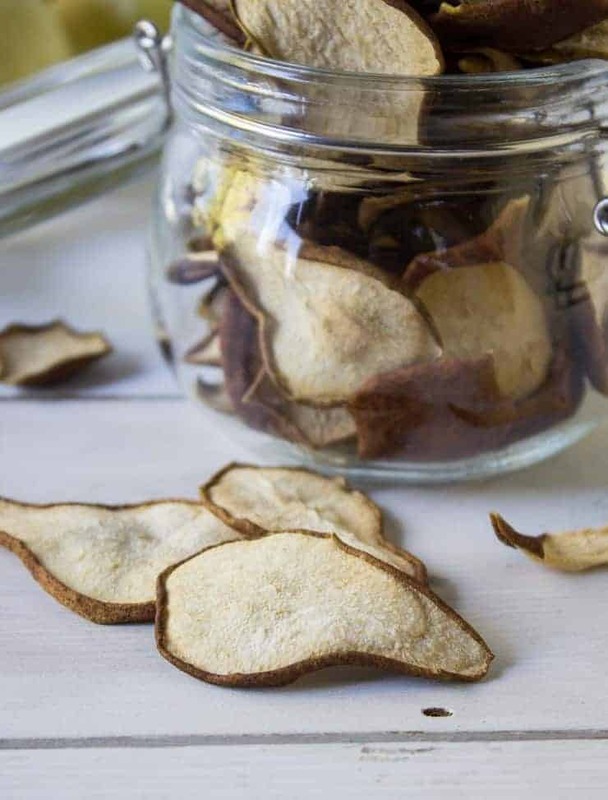 what a great idea to make pear chips! healthy snacking! I can’t complain if this is what my kids are grabbing for a snack. How timely is this? My two pear trees even after culling this spring have so many pears ready for picking they have broken some branches! I never thought to try to dehydrate these green, but thanks to you, today I’m filling my dehydrator up! 🙂 Thanks so much for posting this. Hooray for a huge pear crop! So glad you are dehydrating them! They make such a great snack! Welcome! I am a busy working mom who loves to cook mostly from scratch, grow a garden and raise farm animals. Take a look around! Copyright 2019 Beyond the Chicken Coop - All Rights Reserved.